1. Destiny is a ‘well designed’ game in the way a chair might be well designed or a lampshade might be well designed. It is the IKEA Billy bookshelf of videogames: safe, sturdy, inoffensive; as a Billy bookshelf does a very competent job of being a bookshelf in the most generic, conventional sense so that there is not a home that a Billy bookshelf would look strange in, Destiny is a very competent game in the most generic, conventional sense. It’s the safest possible game Activision and Bungie could have created. Like some kind of ur-videogame object. Maddy Myers said on Twitter yesterday that it looks like the kind of videogame you would see in the background of a film, and she’s not wrong. It is derivative, generic, and conservative; but not in the sense that it fails to achieve some innovative greatness that it is aiming for. Rather, it is clearly derivative, generic, and conservative by intent. It doesn’t want to be something creatively progressive or imaginative. How then to evaluate it? I typically like to approach a game on its own terms. Not in some sort of ‘authorial intent’ kind of way. Rather: what does the game tell me about what it is striving to achieve, and how well does it achieve that? Destiny tells me it just wants to be a safe, competent videogame object, and it achieves that very well. So therefore it is ‘good’, I guess. But there is nothing here critically or meaningfully or thematically. There’s no depth. It’s a bookshelf. It’s an object. But it wants to be an object. Ok then. 2. A conversation I’ve had with various friends over the past week has gone like this: “I see you’ve been playing Destiny,” they say. “Have you been enjoying it?” “Yeah,” I answer. “It’s pretty good.” “Cool, so do you think it’s worth picking up then?” “Wellllll,” I reply. “It depends.” It feels like these chats are performances of the conflicting feelings I have with this game. I can’t deny that I am certainly enjoying Destiny. It’s a good, solid grind. Just like Borderlands before it, it’s a treadmill that is pleasurable to run on sometimes: you’re not going to go anywhere interesting, but sometimes just running in an air-conditioned room while watching some numbers go up feels pretty good. So two claims that the rest of these notes will boil down: 1) I am really enjoying Destiny. 2) There is nothing particularly interesting about Destiny. 3. Destiny is Halo+Borderlands. It simply is. That is neither an insult nor a compliment (though, it will probably be one or the other of those pending on how you felt about those previous games). It has Bungie’s solid, heavy, snappy feel that they mastered in the first Halo game and replicated in each one they made afterwards. It has Borderlands‘s FPS-but-an-RPG-ness with damage numbers spraying off enemies and depleting health bars and a constant, repetitive grind that feels good to get caught up with sometimes. But it also lacks Halo‘s compelling every-thirty-seconds strategising, constantly forcing you to constantly rethink your situation based on the particular assemblage of enemies and equipped weapons you find yourself entangled it. It also lack’s Borderlands‘s evocative, over-the-top and self-indulgent style. 4. These comparisons deserve deeper exploration. First, Halo. Many of Destiny‘s connections to Halo are explicit: recharging health, limited guns, the kind of floaty-but-good feel to jumping, regular shifts to third-person, an annoying blue orb bereft of both body and personality. Different crosshairs are lifted from Halo, such as the giant round circle for the shotgun (itself resembling Halo‘s shotgun more than a little bit). Like Halo, guns feel meaty and punchy. Melee attacks feel incredibly satisfying and solid. Punching someone as the tank class feels like you just punched a giant, taut drum. Using a knife as the hunter class feels like stabbing a blade into several layers of stretched, thick plastic wrap: that split-second resistance before it just pops through. Throwing a knife and killing an enemy with a critical hit that was more luck than skill is immensely satisfying. Like Halo, Destiny feels good at its core of pulling-a-trigger-while-pointing-at-some-aliens, and that carries the game a long way. Also like Halo (and also like Oni, really), Bungie is not afraid to repeat Destiny’s environments over again and again. They will have you walk down the same corridors time and time again to kill the same enemies time and time again. I don’t think this is laziness so much as a confidence that exploration is not why you are playing this game, a confidence that the only role of ‘space’ here is to create an area for you to shoot things in. It gambles that that core loop of shooting things will be satisfying enough that you don’t care that you aren’t actually going anywhere interesting: Earth World wasteland, Moon World wasteland, Venus World wasteland. Halo was the same, with repeated level segments and stages that were other stages backwards. In Halo it never bothered me (though it certainly bothered others) for I was at least progressing a story. In Destiny, though, I am already beginning to tire of seeing the same spaces over and over again. But I keep playing because it feels good. So maybe Bungie’s gamble paid off. 5. So there is a lot of Halo here. But Destiny also lacks what made Halo interesting. It’s hard to over-estimate just how satisfying Halo‘s battles were with the explicit hierarchy of enemies: cowardly grunts, elusive jackals, and cunning elites. Every single elite felt like fighting an equal to Master Chief, and they felt that way, in large part thanks to the many grunts and jackals backing them up. Every encounter was a strategy of figuring out how to pick off the small enemies without being destroyed by the elite, so that then you could destroy the elite without being destroyed by them. It was a juggle of weapons, where individual weapons did not matter so much as what combination of weapons you had. There was so much moment-to-moment strategising that people often fail to appreciate, instead remembering it as the conventional run-and-gun modern shooter that it helped to normalise on consoles. Destiny lacks that. It has interesting-to-fight enemies, to be sure. But they are all the same except for a slightly different placed weak point. Some areas are satisfying to fight in, constantly moving and spinning and throwing knives and grenades. But it’s all grunts and no elites. Even the tougher enemies like wizards don’t require any real kind of strategy, just more bullets. It’s wrong to fault Destiny for not being Halo, but as its similarities help us detail its strengths, this difference helps us detail its weaknesses: Destiny is not strategically interesting. It is just running-and-gunning. 6. Okay I’ll get back to Borderlands soon but I seem to be talking about enemies now. I do like the enemy design of Destiny, even if they are as creatively unimaginative as the rest of the game. Each race has a wonderful style and animation, and are fun to shoot at even if it is straightforward. The later races, The Vex (Cylons) and The Cabal (Warhammer 40,000 Space Marines) are particularly enjoyable as they crumble and collapse. It’s like everything in Destiny: solid, well-crafted, satisfying, just not… interesting. 7. Okay, Borderlands. 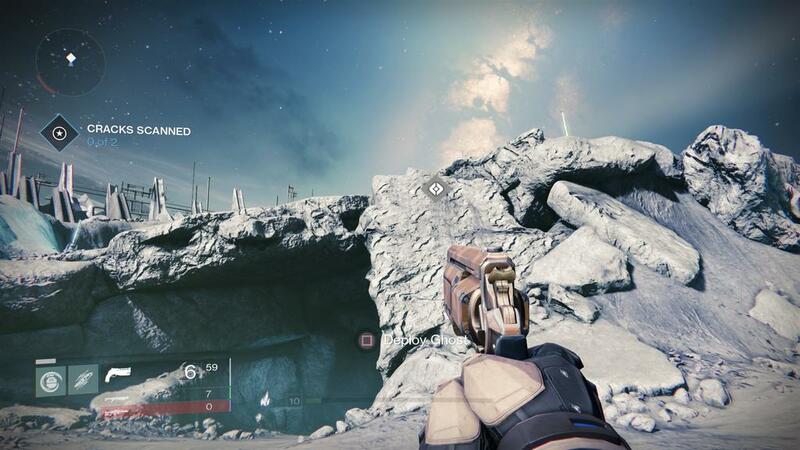 Destiny has clearly been heavily inspired by Borderlands‘s hybridising of first-person shooter gameplay with roleplaying game grinding and levelling. But where Borderlands goes for the over-the-top absurdity in both style and tone almost as an excuse for its own gameiness, Destiny plays it with a straight face. It reminds me, in a lot of ways, of the original reveal trailer for Borderlands before they changed the art style to be something actually interesting. I don’t think Borderlands-with-a-straight-face is necessarily a bad thing. Borderlands‘s humour got very old very quickly. But in style, I always appreciated that Borderlands embraced the fact it was junk food. It never pretended to be anything it wasn’t. You shoot an enemy in the head and they explode in blood, block letters, money, guns, and ammo. All this junk that then gets sucked up into you. It knew that the pleasure it offered was hoarding loot (the very story of looking for the Vault reflected this). Destiny though, is so much more serious about things. Sometimes you pick up little rectangles of ammo. Sometimes little hexagons that give you a picture in a square to let you know you picked up an item. Sometimes, if an enemy drops money, it will spray out of them in a satisfying shower of blue cubes. But then, you can’t pick those cubes up! They just sit on the ground while the interface says ‘+25’ to let you know you picked up 25 cube-dollars. I wouldn’t go so far as to say Destiny pretends to be anything it isn’t (as I say above, it is content to be the very derivative and safe thing that it is), but if Borderlands is junk food then Destiny is like buying a salad from McDonalds. 8. But now I am going to counter that previous note by talking about how much I love the user-interface design of Destiny. It’s menus are sincerely a pleasure to navigate. It’s heads-up display is a nice blend of solid colours and fully-spelled-out words without too many jargony symbols. I like what it looks like! Having to control a cursor with the thumbstick at first seemed counter-intuitive, but the way this allows the game to have roll-over menus is really quite remarkable. Whereas in Borderlands I would always go out of my way to avoid the menus for as long as possible because they were just such a horrible and ugly drag, I’m never annoyed by Destiny‘s menus. I almost look forward to entering them, I enjoy their design so much. This is something that is remarkably rare in videogames, a menu that is enjoyable to navigate, and is I think the one true commendable accomplishment of the game. It helps the game so much that its framing in its menus and its HUD is so satisfying. It gives the game a confidence of style, even if that style is so conservative. 9. And, to swing back the other way, let’s talk about the story, which, I assume, was written by a semi-sentient fax machine. ‘The Darkness’ is attacking ‘The Light’ who must be protected by ‘The Guardians’. ‘The Fallen’, ‘The Hive’, ‘The Vex’, and ‘The Cabal’ are bad. It’s easy to mock Peter Dinklage’s terrible voice acting (and it certainly is terrible), but it’s not like he had anything at all interesting to work with. The semi-sentient fax machine spat out some @videogames_ebooks words in vaguely coherent sentences, and he did the best he possibly could do with them. What strikes me as weird is that they even bothered to get a big name actor in the first place. I guess it gave the press something to write about at an early stage. But it creates this weird dissonance for a game that is so apathetic about its own story to have a known actor talking at me. By large, I don’t care that I don’t care about the story, and I don’t care that the game doesn’t care about the story—that’s not why we’re here. But then, occasionally, it has these long drawn-out cut-scenes where suddenly it decides your avatar is now a voiced character for a little while, like these brief hiccups where Destiny mistakes itself for a story-driven game. And then you go back to fighting The Bad Guys on The Planet with The Gun. But kind of like the repetitive worlds, the story doesn’t matter. It’s not what is meant to keep you here. That core shooting-things loop is what is meant to lure you in. 10. The casual drop-in-drop-out multiplayer is interesting. I enjoy the lack of commitment, of just stumbling across people and then leaving them again. Almost like a shooter equivalent of Journey. It has its hiccups, when I think I’m with a group of people and then turn a corner to find they have all disappeared. But, for the most part, it works fluidly and inconsequentially, which is wonderful. Its very seamlessness feels like an impressive technological and design accomplishment. Perhaps the only one in the game. 11. Destiny does not do its own systems justice. For fifteen levels of grinding, your character’s development is linear, their options limited, the places you can go and the things you can do defined quite narrowly. It is not until you get closer to level twenty that you begin to unlock other missions and more interesting gear and alternative subclasses. It’s not a ‘deep’ game by any means, but there are systems there that are still quite elegant and interesting, especially when you join a fireteam with other players and learn how your abilities complement theirs. But for hours upon hours, none of this is hinted by the game. With the exception of specific upgrade screens, there are no greyed out boxes hinting at vast unexplored potentialities, or loading screen tips suggesting prospective future decisions. It feels like it is going nowhere for a long time. It expects you to trust it. I have not reached the endgame yet, and even though it has begun to open up in more interesting ways, I am yet to be convinced there is going to be much there to convince me to go back and walk the same corridors and fight the same enemies over and over and over again just to get a better character to do the same thing over and over and over again. It’s fun for a time, but there’s not a whole lot there trying to convince you to stay. 12. In six months time, I don’t think anyone will be talking about Destiny anymore. It is a well-designed videogame object. A thing. A consumer product that was made to be purchased and consumed. It is ‘digestible’ as Push Me Pull You Michael McMaster said to me yesterday. Something I can see myself doing for a while, something that I will enjoy going through the motions of for a bit. But something so lacking in creativity, imagination, and personality. Destiny is a well-designed object crafted by people who are clearly talented at making this kind of object that does the things that this kind of object does. Like a piece of IKEA furniture. Like a chair. Like a lampshade. I’ll appreciate it for a while, and then it will just blend into the lounge room. 13. Two months after posting these Notes, I am still playing Destiny. I have written some further thoughts on it here. This entry was posted in Notes and tagged Destiny by brendankeogh. Bookmark the permalink.